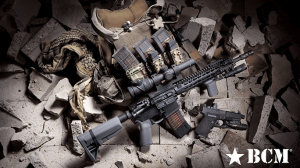 Seekins Precision steps up to the hard-hitting 7.62mm with its new SP10! 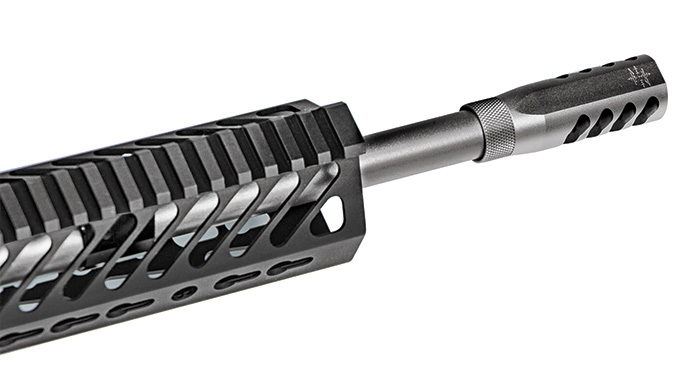 The SP3R handguard has a flat base, providing a stable support for off-hand shooting. From its match- grade barrel to its 3-pound trigger, the SP10 was built to deliver top-notch precision in tough conditions. 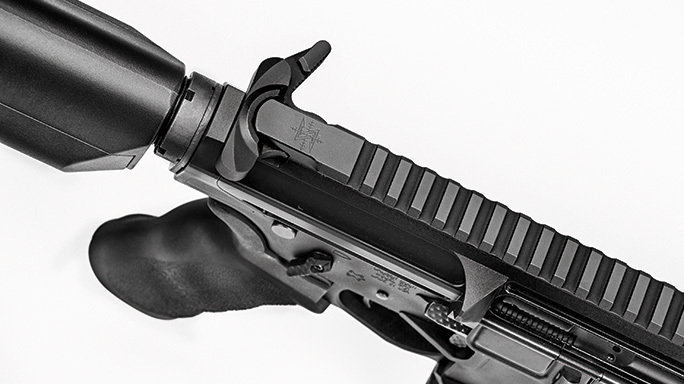 The BCM Gunfighter charging handle ensures that users wearing gloves can easily manipulate the bolt under stress. The 18-inch, match-grade, stainless steel barrel comes with a flawless bead-blasted finish and a recoil-reducing ATC muzzle break. Precision. If ever a company’s name could describe its products, this is the case. 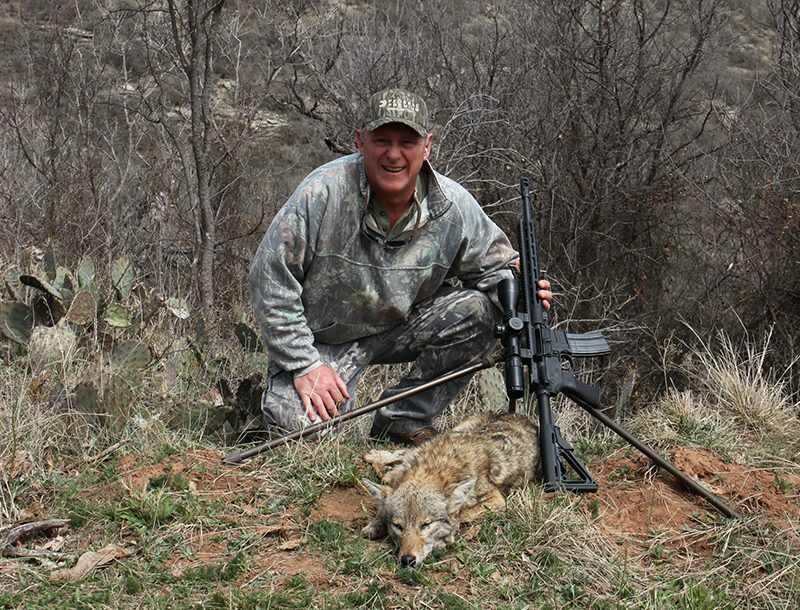 From the scope rings that first helped launch the company to the high-quality rifles made today, Seekins Precision has a history of building top-notch shooting products that deliver rounds on target. 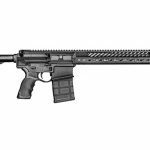 Precision is an apt description of the company’s SP10 rifle. It is an AR-style rifle chambered in 7.62mm NATO that provides incredible performance. 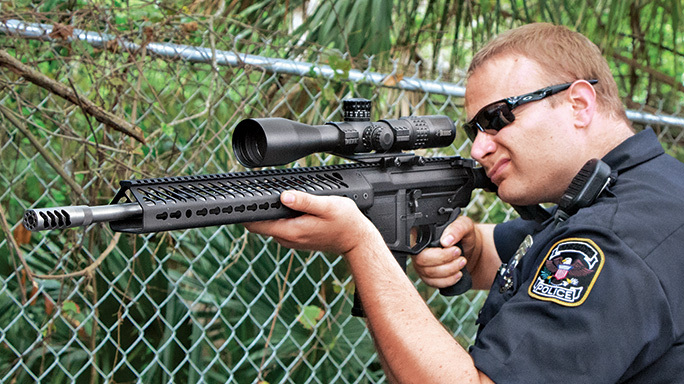 Many police department snipers employ rifles chambered for the 7.62mm NATO to handle the “must make” shots in high-danger situations. The combination of accuracy and power inherent in the round make it a very good choice in many situations. Matching a rifle to the capabilities of the round is incredibly important. Many sniper teams have relied on bolt-action guns to make these types of shots. However, there are a number of units that prefer the benefits of a semi-automatic rifle when lives are on the line. 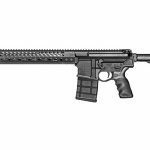 If your team needs a .30-caliber rifle that can provide extremely good accuracy from a semi-automatic platform, let me introduce the SP10. Seekins Precision builds the SP10 to be a fighting tool. The company uses an 18-inch, match-grade barrel made of stainless steel. Capping the barrel is Seekins’ ATC muzzle brake, which reduces both recoil and muzzle rise. Both the barrel and brake have a flawless, bead-blasted stainless steel finish. 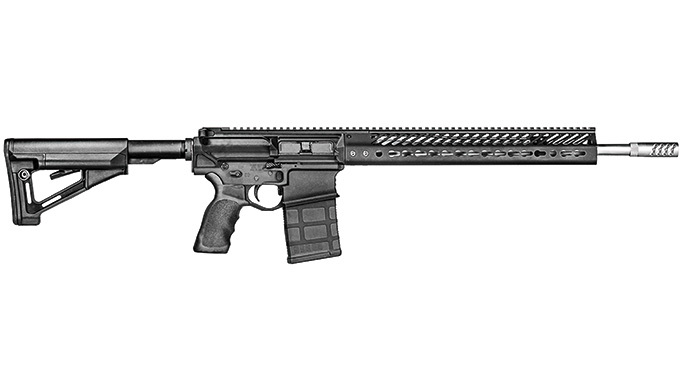 One of the more distinctive visual characteristics of the SP10 is the 15-inch SP3R handguard. 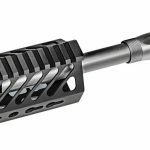 The handguard is essentially a five-sided, machined aluminum unit that integrates a number of useful features. The handguard is designed so that the bottom of the unit is wide and flat. Compared to many round handguards, this gives the SP10 a wider, more stable base when shooting off of an improvised rest. Along the bottom, right and left sides of the handguard are KeyMod slots for adding accessories. By using KeyMod slots instead of Picatinny rails on these three surfaces, Seekins shaves ounces from the overall weight of the gun. Also on these three sides are a total of six QD sling attachment points. The top of the handguard has a full-length Picatinny rail for mounting sights and optics. For this review, I mounted a Burris XTR II 4-20x50mm riflescope on the SP10 using a one-piece Burris mount. This scope uses a first-focus-plane reticle and multi-coated lenses. Burris hand-fits the internal assemblies in this scope and uses triple spring tensioning to make the scope shockproof and vibration resistant. 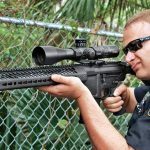 For a rifle that might be carried in the trunk of a patrol car and banged around more than a typical hunting gun, shock resistance in the optics is mandatory. I’ve used this scope on several 7.62mm rifles, and it has always performed well. A Magpul STR stock is used on the SP10. This adjustable stock has a number of desirable features, including a pair of water-resistant compartments for storing CR123 batteries. These compartments round out both sides of the stock for greater comfort and a stronger cheekweld. Additionally, the stock incorporates a secondary friction lock. This lock helps eliminate any wiggle in the stock and reduces the likelihood of accidentally activating the length adjustment lever. Magpul also built in a pair of QD sling attachment points: one on each side of the rifle. These work well with the integral QD sling mounts in the handguard. The SP10 uses a BCM Gunfighter charging handle, which I consider one of the best on the market. 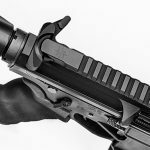 After I experienced a roll-pin failure in the charging handle of one of my personally owned AR rifles, I took a hard look at the aftermarket options that were available. The BCM Gunfighter charging handle takes a lot of the pressure off of the roll pin, making it far less likely to fail. Additionally, it gives the shooter a larger gripping surface that can be very helpful when clearing malfunctions or when wearing gloves. For a gun that can be used in high-risk tactical scenarios, this small upgrade can make a big difference. For a pistol grip, Seekins equipped the SP10 with a deluxe Ergo model. This grip is made of a soft, rubber-like material that helps provide excellent control of the gun. 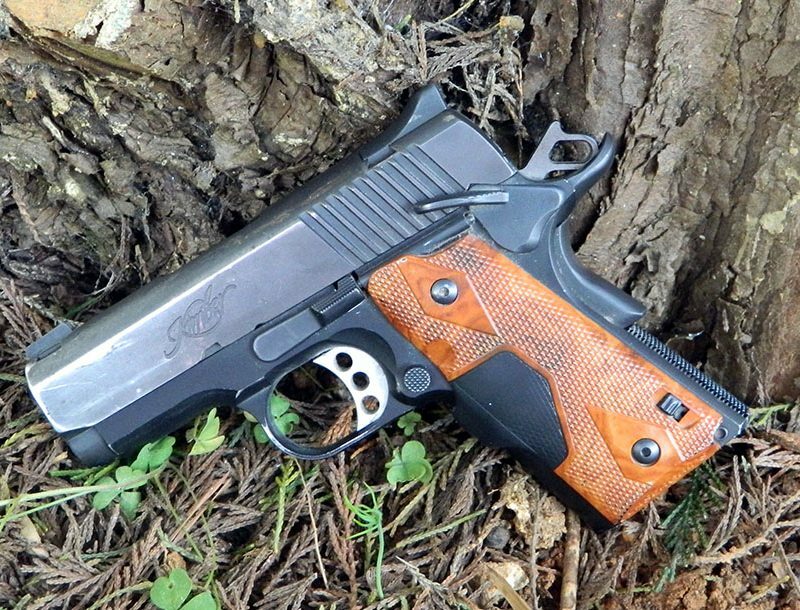 The grip is larger than other pistol grips, so those with larger hands are more likely to appreciate the grip than folks with smaller hands like myself. Even though the grip felt a little large in my hand, it did not impair my trigger reach at all. A single-stage, curved CMC trigger is standard on this rifle. It is very light and crisp. There is no sign of grittiness nor any perceptible take-up or overtravel. It is one of the cleanest triggers I have felt on a factory gun in a long time. With a Lyman digital trigger pull gauge, I measured the weight at 3.06 pounds on average for 10 pulls. If you are not familiar with the company’s products, CMC Triggers is a Texas manufacturer that builds drop-in trigger assemblies for AR-type rifles. Frankly, the triggers feel exceptional and are aggressively priced. I really like the company’s products, and the unit installed on the SP10 is typical of the company’s quality. Ambidextrous controls are standard on this rifle. The bolt release, magazine release and safety selector are accessible from both sides of the gun. A 60-degree short-throw lever is used for the safety selector. It is textured and easy to manipulate. Finally, my test SP10 came in soft-sided carry case with a 20-round Magpul PMAG. When I first received the gun for testing, I immediately liked it. But, I truly fell in love with the SP10 at the range. The gun was deadly accurate and absolutely reliable. The recoil was modest, and the trigger pull was sweet. I found the SP10 to be supremely accurate with every ammunition load I tried in it. The 175-grain Sierra MatchKing load from Gorilla Ammunition was the most accurate, making a best five-shot group a little larger than 0.6 inches. Other loads from Federal and Remington were good for five-shot groups of 0.75 inches. The worst performer on the range was some old military surplus ammo that still managed groups of about 1.25 inches. When testing the different loads in the rifle, I used a front sandbag rest and shot from a bench. I did not use a rear bag or a rigid rifle rest. So, the potential accuracy of the SP10 is greater than the accuracy I achieved. Frankly, the shooter is the weak link in this evaluation. Equally important to accuracy is reliability. The SP10 was perfect in this respect as well. Running loads from several different manufacturers, with bullet weights ranging from 150 grains to 175 grains, the gun cycled perfectly. Running the rifle from both shoulders, the ambidextrous controls worked as expected. The short-throw safety selector was clearly superior to the standard lever, as I could quickly operate it without altering my grip on the gun. The Seekins Precision SP10 rifle performed admirably for me. I could find no flaws in either its form or function. Rounds were delivered on target with relative ease. As an accuracy-focused semi-automatic rifle, the SP10 is an unqualified winner. I believe that every department should give its sniper teams a wide degree of discretion when selecting a precision rifle. Deciding which rifles to deploy should never come down to price alone, but should instead include considerations of accuracy, reliability and suitability to the probable scenarios in which they might be used. 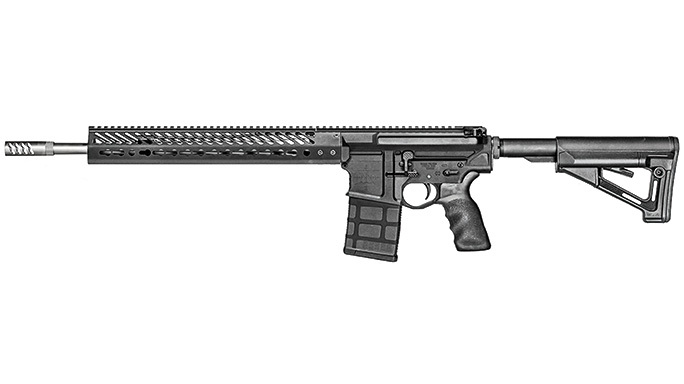 Seekins Precision built this rifle to be accurate and reliable. With the abundance of AR-type accessories on the market, the gun can be further customized with relative ease to a department’s anticipated needs. While I would never presume to tell a department what to buy, I would strongly suggest that teams consider the SP10 if it appears to match their requirements. For more information, visit seekinsprecision.com or call 208-743-3400.